By Sandy Sizmur, member of the Phoenix Walking group and co-author of ‘On and off the Beaten Track’ walking books 1 & 2. This 6km walk is centred on part of the village area where many residents live and work in agriculture. By traveling along the old main road, lying almost parallel to the B7, and then crossing over there is an opportunity to enjoy the countryside with fields of cereal and green vegetables thriving among the citrus and olives groves. The views at the highest point of the trail are surprisingly wide-ranging and put the main road from Paphos to Polis into context. The walk will take about 1.5 – 2 hours. The tracks and roadways are well-established but there is little shade throughout. There is one steep ascent and a corresponding descent during the hike. To get there. From Paphos take the B7 until past Skoulli. Drive on, looking out for the ‘infamous’ Goudi crossroads where police frequently wait for speeding vehicles. About 250 metres further on the left is a kiosk where citrus fruits are the main produce for sale. Immediately beyond the kiosk is an open area, with a sign, for parking. This is the start point for the walk. Coming from Polis use the B7, drive past Chrysochou on your right and continue approximately 1.5km till the Orange seller’s kiosk appears on your right. Park as above. Walk past the Orange seller’s kiosk, carefully down the main road to the crossroads and go right. This is part of residential Goudi and most properties have fruit trees in their gardens. Unusually this road has a pavement; enjoy it as further into the route it is mostly rough verge! Take the next right turn, a mere 200 metres on, at a crossroads. 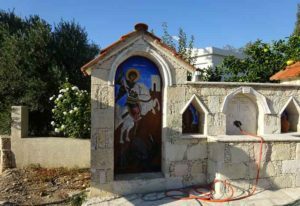 (If you were to walk directly on it would take 10-15 minutes to reach the older, upper area of Goudi where the striking church of St. George watches over a slowly expanding village.) Continue along for about 1 km/15 minutes while admiring the well-kept houses and log stores ready for winter. The next right turn you need to take is the third one you come across more or less at the 50km. speed-sign on the edge of Chrysochou, once a Turkish Cypriot village. Go up here past sheds and outhouses and after about 200metre the main road becomes apparent. The kiosk serves refreshments and The Stone Lion, directly opposite up a sloping trackway, has a full menu for 6 days of the week from 10am to 10pm.